InSight sensors captured a haunting low rumble caused by vibrations from the wind on Mars, estimated to be blowing between 10 to 15 mph (5 to 7 meters a second) on December 1, from northwest to southeast, NASA said on Friday. The two instruments recorded the wind noise in different ways. The air pressure sensor, which will collect meteorological data, recorded these air vibrations directly. The seismometer recorded lander vibrations caused by the wind moving over the spacecraft’s solar panels, which are each 7 feet (2.2 meters) in diameter and stick out from the sides of the lander like a giant pair of ears. In a few weeks, it will be placed on the Martian surface by InSight’s robotic arm, then covered by a domed shield to protect it from wind and temperature changes. It will detect the lander’s movement through the Mars surface, said NASA. SEIS is recording vibrational data that scientists later will be able to use to cancel out noise from the lander when SEIS is on the surface, allowing them to detect better actual Mars-quakes. 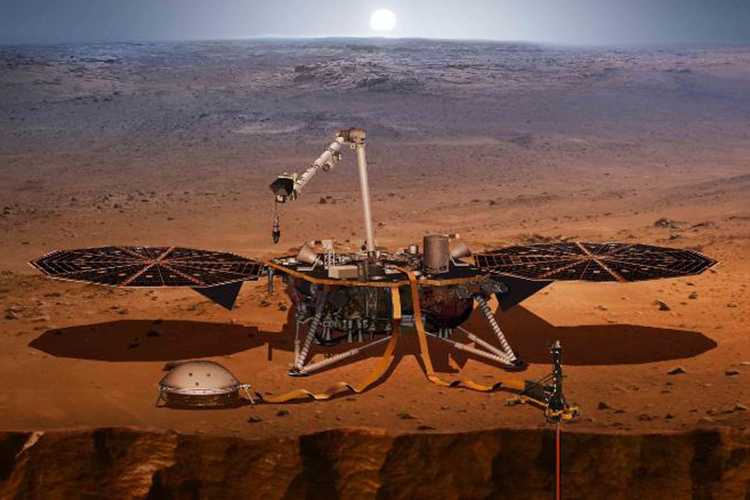 InSight landed safely at Elysium Planitia on Mars on November 26, kicking off a two-year mission to explore the deep interior of Mars.